The media fraternity of India observed an unusual Gandhi Jayanti this time as scores of scribes across the country organized protest demonstrations in different locations with sole demand for ensuring security and justice to working journalists. Press clubs, journo-bodies and media organizations formed human chains, symbolic protests and also took out missiles in support of the demand. The reason behind in demonstrating their angers on the birthday of Mohandas Karamchand Gandhi on October 2 was the relentless violence against the journalists in different forms across the south Asian nation. With the spirit of Mahatma Gandhi, who was a dedicated journalist before emerging as India’s Father of the Nation, the media fraternity thus committed to defy all mental & physical challenges in their professional lives. For any reason, the largest democracy in the globe remains an unsafe place for serious journalists irrespective of the regimes in power at New Delhi or any province capital. The populous country witnesses the murder of around five media persons annually and that has not been changed for decades. The land of Lord Bishnu and Bhagawan Buddha has also failed to resolve any of those journo-murder cases legally. The month of September poured three shocking news of journo-murders in the country and the media fraternity along with their well-wishers have seemingly rediscovered the vulnerability for those scribes who pursue critical journalism. The year 2017 has witnessed the killing of eight journalists in nine months, but as usual the reactions to those killings from the authority and the public remain lukewarm. 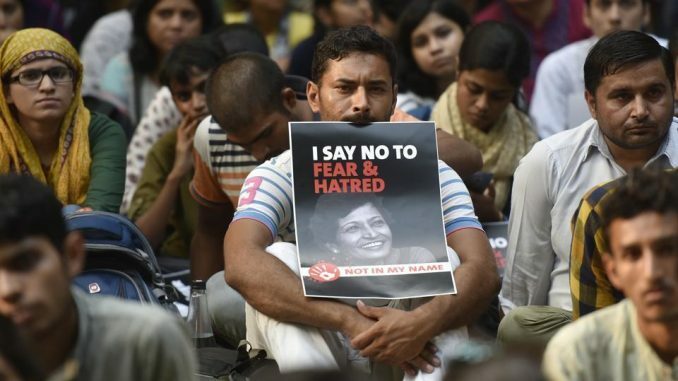 It was only Kannada editor-journalist Gauri Lankesh’s murder on September 5 at her Bangaluru (earlier known as Bangalore) residence that aroused massive protests across the country. Publisher of Gauri Lankesh Patrike, a Kannada language newspaper in Karnataka of central India, Ms Gauri was shot dead by unidentified gunmen, following which strong reactions were observed not only from inside the country but also various international organizations. A Left ideology inclined journalist Ms Gauri’s assassination tempted more civil society groups, which are predominantly against the Hindu nationalist ideologue like Rashtriya Swayamsevak Sangha (RSS) along with Bhartiya Janata Party (BJP), to come to streets demanding justice. They were in hurry to make statements that the outspoken journalist was targeted by the ruling political elements as she used to criticize both RSS and BJP absolutely. However, the Congress ruled Karnataka province government and its chief minister Siddaramaiah had a cordial relationship with Ms Gauri. Soon after her assassination, the province government chief announced her demise as a personal loss. But for reasons, best known to Siddaramaiah only, the chief minister’s reactions against the killer(s) of Ms Gauri, 55, were soft. So does the investigation process! Protest-demonstrations were so loud that it inspired a Communist Party of India (Marxist) run Tripura government chief to personally join in a demonstration at Agartala. The chief minister Manik Sarkar’s participation in the protest program encouraged the media fraternity of northeast India and he was thoroughly appreciated for the gesture. But when a young television scribe of Tripura itself was beaten to death by a mob, the same CPI (M) chief minister remained silent. The Agartala based journalists, while condemning the murder of Shantanu Bhowmik on September 20, had to raise voices for getting reactions from Sarkar. Even then the chief minister, also in charge of home portfolio, pronounced a spongy reaction towards the incident. However, the condemnations from carious national and international bodies were pouring against the brutal murder of Shantanu, 29, who used to work for an Agartala based Bengali-language cable news channel named Din-Raat. A series of protest programs were organized by various Indian media bodies across the country demanding justice to Shantanu’s bereaved mother and sister. On the fateful day, Shantanu went to cover a program of Indigenous People’s Front of Tripura (IPFT), which was pretesting against the ruling CPI (M) and slowly it turned violent. Claimed to have supports from the tribal population of Tripura, the IPFT maintains its demand for a separate homeland (read Twipraland) for the tribal people out of Tripura. The party, which has seemingly a political understanding with the BJP, continued its violent protests since the last few years. The IPFT protest program at Mandwai of west Tripura, bordering Bangladesh, soon witnessed the arrival of many cadres belonged to the CPI (M)’s tribal wing Tripura Rajya Upajati Ganamukti Parishad (TRUGP) at the location. Both the parties had already engaged in violent clashes on the previous day at the same location. So the situation got charged and finally members of both IPFT and TRUGP turned aggressive and later violent. Shantanu started shooting the violent activities with his mobile phone, as his lens-man avoided the professional camera for fear of abusive reactions from the agitators. As Shantanu started capturing the visuals of IPFT members attacking the opponent & police and also damaging vehicles on the roadside, he was asked initially to stop recording. Later the protesters chased him for the phone and some of them turned unruly to finally attack Shantanu with stick-rods and other sharp items. Blood soaked Shantanu was rescued and sent to the hospital by the police, but till then he stopped breathing. His phone was however missing, which was also revealed by the State police chief Akhil Kumar Shukla. Meanwhile, Shantanu’s killing was condemned and condoled by various international forums like the New York based Committee to Protect Journalists (CPJ), the Pars based Reporters sans/without Borders (RSF), the Brussels based International Federation of Journalists (IFJ) etc, where everyone asked the Tripura government to go for a ‘thorough investigation’ into the death of Shantanu to bring those responsible to justice and also ensure the future safety of journalists. In India, all influential media bodies like Indian Newspaper Society, Editors’ Guild of India, Broadcast Editors’ Association, Press Club of India, Indian Women’s Press Corps, Federation of Press Clubs in India besides various journalist unions strongly condemned the murder of Shantanu and urged the Manik Sarkar government help delivering justice. Even the Press Council of India, a quasi-judicial body, took note of Shantanu’s killing and sought a report from the Tripura government. All media bodies of northeast India came put with the protest demonstrations against the killing of Shantanu and demanding a high level probe (preferably by Central Bureau of Investigation). Extending moral supports to the Tripura journalists for justice, the media bodies asked the government to compensate the family of Shantanu adequately. They also urged the Union government in New Delhi to formulate a national action plan for delivering earliest justices to journo-victim families. According to the RSF , India is ranked 136th among 180 countries in its World Press Freedom Index (2017) barometer, which is just ahead of its neighbors like Pakistan (139th), Sri Lanka (141), Bangladesh (146) and China (176). Norway topped the list where India’s neighbors including Bhutan (84), Nepal (100), Maldives (117), Afghanistan (120), Burma (131) etc are ahead of it. One party ruled North Korea (180) is at the bottom of the list, where Vietnam and China were placed at 175th and 176th positions respectively. The string of India journo-killings began with Hari Prakash (killed on January 2) and the trend continued with the murder of Brajesh Kumar Singh (January 3), Shyam Sharma (May 15), Kamlesh Jain (May 31), Surender Singh Rana ( July 29), Ms Gauri, Shantanu and KJ Singh (September 23). India lost six journalists to assailants in 2016, which was preceded by five cases in 2015. It witnessed murders of two scribes in 2014, but the year 2013 reported as many as 11 journalists’ murders.